We residents of Las Vegas and Southern Nevada may not have to worry about snow or ice storms cutting power to our homes, but that doesn’t mean we’re immune to electrical problems that can be dangerous, and even life-threatening! Some of these are aggravated by our hot, dry climate and some may be due to substandard materials and work done by contractors who were never fully educated about nor licensed to perform electrical work. Our dry climate affects lots of things adversely — from fine wood furniture to the electrical wiring in our homes and businesses. Because the air is so dry, the insulation surrounding wires often cracks or breaks, causing shorts and grounds that can cause fires and cause nasty electrical shocks! Another thing that our climate contributes to is overuse of our fans and AC systems. They’re often running non-stop, and can overheat (as can any overworked electrical component), and either fail — if you’re lucky — or worse, cause an electrical fire. This is a big problem in the Las Vegas area, due to the transient population and frequent fluctuations in construction demands. Unfortunately, Las Vegas often has a surplus of unlicensed contractors operating in the area who are neither qualified nor properly trained to perform electrical work. The result is unsafe installations and work that doesn’t begin to pass state and local codes. When Penny Electric’s licensed electricians do inspections of area homes, poor quality wiring and substandard electrical work in violation of code are issues we encounter again and again! It’s one thing if your roof fails, for example, because of poor quality work, but it’s quite another when the failure is with poor-quality wiring and electrical work. Now you’ve got more than a hassle and added expense — you’ve got a dangerous situation on your hands! Unfortunately, some of the home builders erecting tract homes are often guilty of installing cheap or substandard electrical equipment in an effort to cut costs and increase their profit margin. 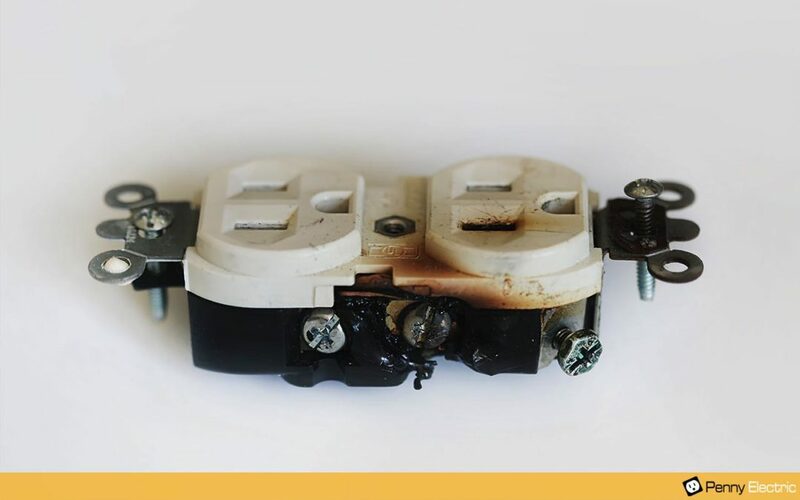 Amazingly, it’s common for homes that are only 2 to 3 years old to require replacement of electrical outlets and other electrical components due to parts failures! Many older homes are trying to run a modern household with an electrical panel designed to take care of the needs of homes decades ago. A lot has changed in all those years, and a 100-amp service just can’t keep up with the demand of today’s high-tech appliances and the many electrical gadgets commonly in use today. Upgrading to a 200-amp (at minimum) service is the only logical fix, otherwise problems will just keep occurring, and overloads can be dangerous, to say the least. Rodents are a problem for homes everywhere. They keep their teeth sharp by gnawing on wires, causing damage that leads to shorts and grounds, which means they raise the potential for fires and shocks substantially. And because they multiply so quickly, you could easily have an army of chewing rodents “working” on your wiring before you know it! Many families living in and around Vegas have pools. (They just make sense in our climate!) Hazards arise when power supplies and electrical appliances and gadgets end up too close to the pool. We all know that water and electricity don’t mix, but that doesn’t mean that we don’t sometimes take chances or assume that nothing bad will happen! Electrical hazards are more than a nuisance; they’re a real danger! In fact, it’s a smart idea to have your electrical service and your home’s wiring inspected from time to time to make certain that you’re not living with an unseen danger. Let the licensed electricians at Penny Electric inspect and take care of all of your electrical needs. We’re your trusted source for safe and dependable electrician services with licensed, bonded and insured electricians ready to solve your electrical issues and ensure your safety when it comes to any and all things electrical. We serve the greater Las Vegas – Henderson area, so why not contact us today?